On her first trip out in my carriage on the Naples Causeway we were passed by an ambulance with siren blazing. She never flicked an ear. On the fourth of July she slept through the fireworks as a friend and I watched from the drivers seat. Rose is as solid as they come. Often sleeping between tours to reserve energy, many people think she looks tired of her job. She is just a really efficient organizer of her time. Once on New Year’s Eve in front of LL Bean the fireworks started early. I was surprised at just how loud those fireworks were between two three story buildings. It sounded like a war zone. 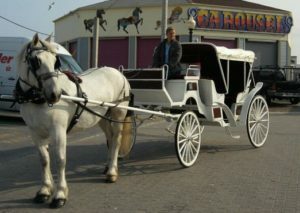 The horse in front reacted by trotting forward and his driver let him go. Rose who’s instinct would be to follow her herd mate and get away from the deafening and sudden noise, listened to the very slight tightening of my hands on the lines and stood….she did not move a single hoof. She did not attempt to leave the deafening valley between the buildings, simply because her driver quietly asked her. She did, however, quiver in front of the driver. Her hindquarters shook, trembling with each loud explosion and echo of the fireworks but she persevered. Rose stood through that terrifying episode with grace and absolute teamwork with her driver. 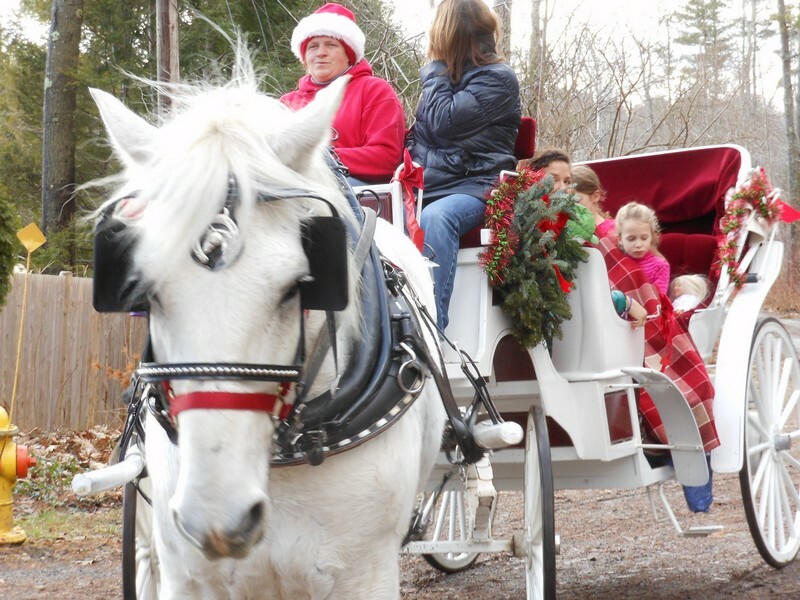 Each winter Rose participates in many seasonal events from harvest celebrations at daycares and malls to Christmas celebrations at the The Portland SeaDogs and in Freeport. Last year Rose participated in a music video that used the Historic State Mental Hospital Building in Augusta as the back drop for a portion of the song that describes the day a family left their mother and wife at the hospital in the early 1900’s. Rose is a favorite for regular riders here at the farm. She is quiet for our beginner riders, her wide stance feels solid and safe for new equestrians. She is perfect for intermediate riders who want smooth transitions between gaits and a steady pace. She follows without question and is easy to stop and turn. 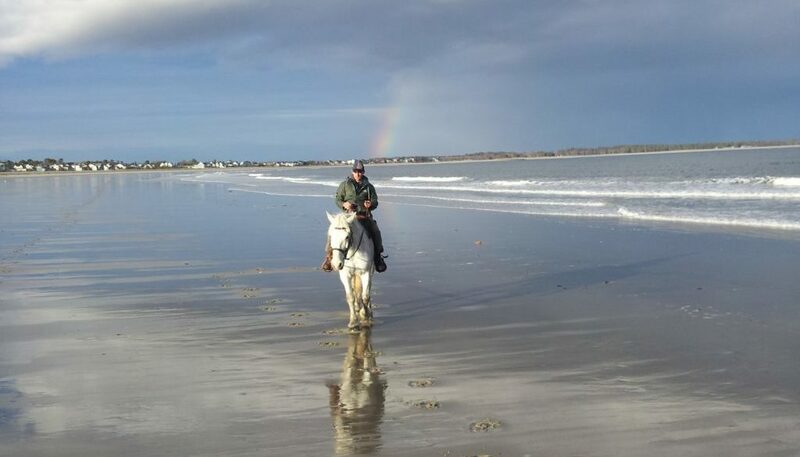 A lot of fun on the trails and beaches. Rose is the first choice for most of our weddings because of her white color. She does all of our baraats because of her famous quiet patience. She often naps during the colorful, loud and shifting dances of the baraat directly in front of her. She has done weddings in many beautiful settings including Eagle Mountain House and Golf Club, Trolley Park in Westbrook, Blackpoint Inn in Scarborough, and even apple orchards and rustic farms in the Western Mountains of Maine. Rose is quiet, sweet and always game for the next adventure. She been just about everywhere from woods and mountains to downtown and local parks. She is framed in memories in thousands of family albums.